We made it through the polar vortex last week. 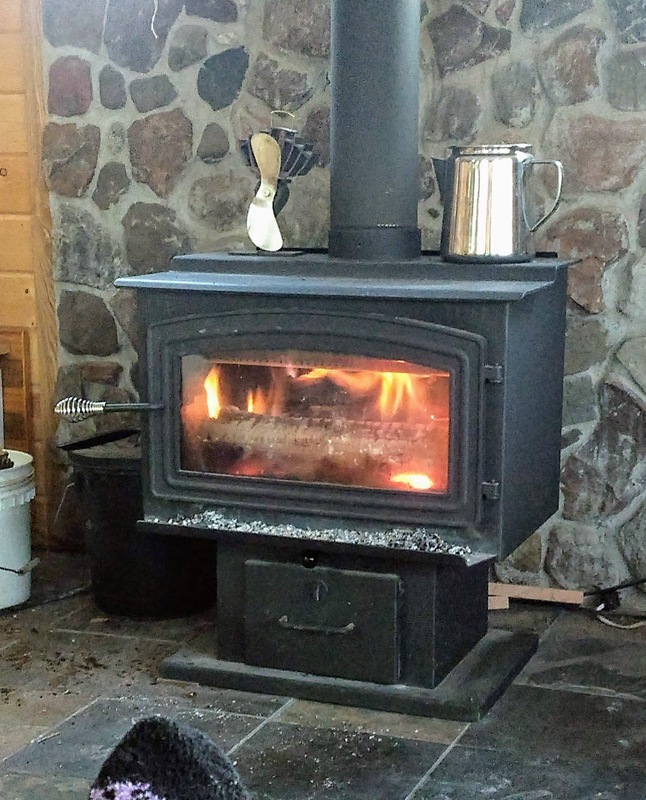 Our air temps got down to -38F, they were below zero for several days. Thank goodness it wasn't longer. 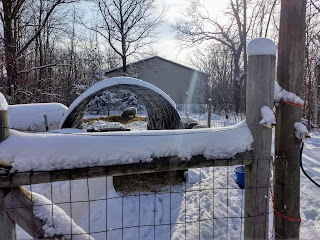 The water line to the barn froze up, our vehicles wouldn't start for a couple days, and things were getting a little testy with the sheep feed running low. 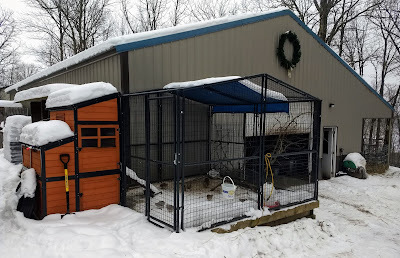 Anyway, I am so impressed with our animals and how they managed during the cold temps! The chickens roost in the barn, which is open on the south side to lean-to, where the ewes sleep. The lean-to runs along the whole south side of the barn, but only half of it is walled off. So there is plenty of ventilation. We don't want the sheep stuck in a tight barn, that's just an invitation to pneumonia. The girls were actually feeling kind of feisty at the high temp of -14F on Wednesday afternoon when I went out to feed them. The seven wethers have a T-post/tarp shelter and two fiberglass calf huts. They did fine. Our ducks sleep in the barn, on the floor. But one of the cold nights they slept out in the lean-to with the ewes. I was worried about them getting picked off by an owl, but they were fine. 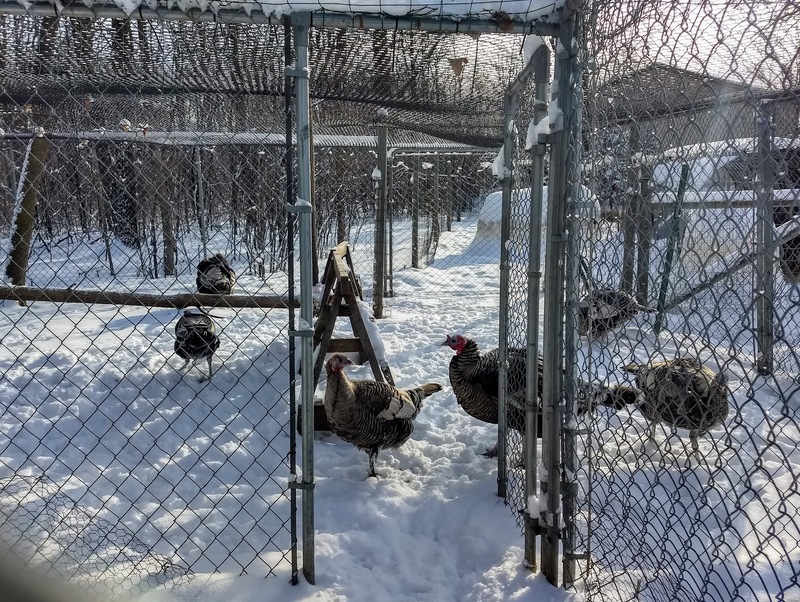 The Narragansett turkeys roost in their covered pen. 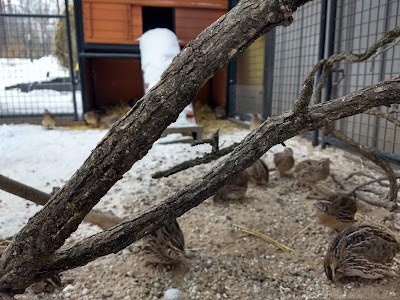 They have a small shed that houses their feed and is equipped with roosting poles, but they never go in there except to eat; even during the worst thunderstorms and snowstorms. 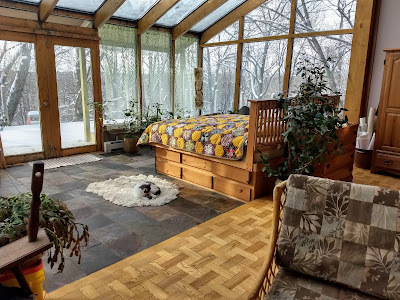 And Sid and I sleep under a glass ceiling. That can feel pretty cold when temps are so far below zero. 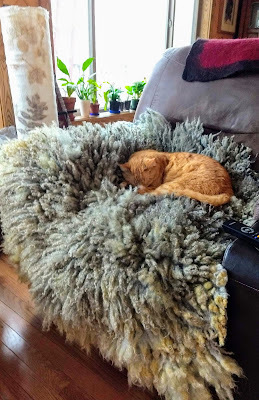 We had three quilts and several cats to keep us warm. I'm going to make some shades for those overhead windows ASAP. We were wondering how the Coturnix quail would do in the extreme cold. In the past we've kept them in the shop or out in the barn over the winter months. That wasn't without problems, they are so messy. Last year Sid processed them all and started out fresh with eggs last spring. But this year Sid put them in the Defender chicken coop that he won last summer. It's a great pen for them. Right before the extreme cold hit, we bought straw bedding for the wethers' calf huts and saved a couple flakes for the quail pen. We also have a heated poultry waterer in the quail pen which stayed operational. 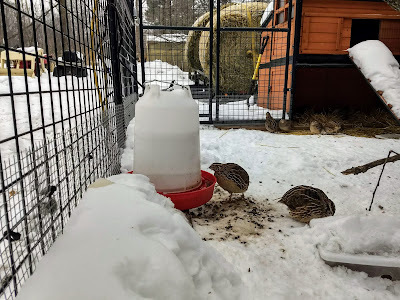 The quail came through the extreme cold with no issues at all. So now we know!